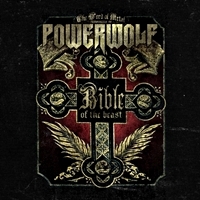 Inspired by the bible, or should we say by the appearance of the devil in the bible, Powerwolf launches their next album 'Bible of the Beast'. The key word for this album could be: more! More bombast, more clichés (lyrics), more power, more dramatically parts, more choirs, more Powerwolf. They extended their music-style even more. Powerwolf has the ability to combine all the clichés in power metal into well written songs. There is not so much originality left, but I just like it this way. The songs have more tempo and are a bit heavier than on their last album. The dramatic vocals of Atilla Dorn (a classic schooled opera singer) finishes it off. Powerwolf is a kind of mix between Manowar and Sabaton. Especially fans of the last mentioned band will like Powerwolf as well. The choirs on this album are not done by studio overdubs, but a choir of 25 classic skilled singers took care of that. With the mix done by Frederik Nordström the album is complete. This record beats their last album 'Lupus Dei' on all fronts and even that record was not a bad one. For some metal fans it is perhaps all too 'over the top', but I enjoyed it very much. I have the honour to interview the band, and I will certainly ask them what the song "Resurrection by Erection" is about. The Wolves are back: woooooooooooooeeeeeeeeeeeeeeeeee! !